For the second year in its 106-year history, The New York Times will collaborate with GoFundMe to raise money for The Neediest Cases Fund, which gives direct assistance to people in need. During the campaign, which runs from October 15 to January 12, The New York Times will share the affecting stories of the children, families, and elderly who were helped by the fund, showing how even modest donations can make a difference. 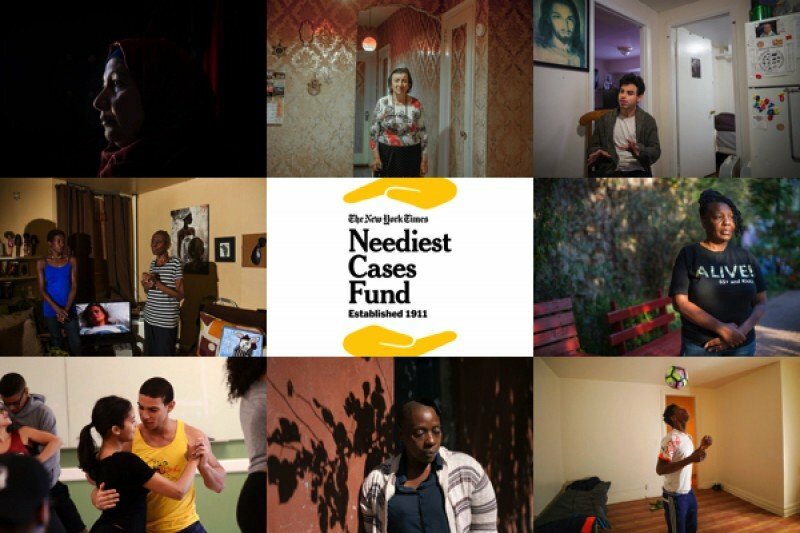 Last year, donors to The Neediest Cases Fund gave more than $6 million to benefit eight nonprofits who serve people in need in the New York area and beyond. GoFundMe is proud to again be the platform behind this yearly giving tradition. Through the power of GoFundMe’s social fundraising, more people can more easily contribute and change lives for the better. In this collaboration between The New York Times and GoFundMe, 100% of the amount donated will go directly to support one of these great causes. In addition, The New York Times Company pays all administrative costs of the Neediest Cases Fund so that every gift goes directly to serve the needy. On Sunday through Thursday, The New York Times will profile individuals who have been helped by the fund. Each story will include a GoFundMe, allowing readers to contribute directly from the story. You can see the campaign and donate here. The encounter left the publisher thinking about charity. Helping a stranger had given him a sense of satisfaction, and he wondered if one man’s feeling might be the basis for a city’s goodwill. The next year, he sent a reporter to several of the city’s private welfare agencies to collect stories about the poor. He had a plan: to publish articles about the Hundred Neediest Cases in New York. The appeal would be made not with a direct request for money but with the facts of their lives. These small chronicles, it turned out, sounded a powerful call. The campaign began Dec. 15, 1912. Soon other publishers in the United States and abroad adopted the idea that a newspaper could make a general appeal for the needy and thus help established welfare agencies solicit funds. The first year’s contributions totaled $3,630.88. The total now is about $6 million a year, and over the years the Fund has raised more than $294 million. The New York Times Neediest Cases Fund has been recognized by the Internal Revenue Service as a 501(c)(3) not-for-profit public charity. Contributions to the Neediest Cases Fund are tax-deductible to the extent permitted by law. Established in 1911 by Times publisher Adolph S. Ochs, the Neediest Cases Fund has since raised over $294 million and provided direct assistance to those in financial need in New York and beyond. The Fund’s 106th annual campaign runs from October 15, 2017 through January 12, 2018. Each profile illustrates the stories of those who benefited from the fund and shows the difference that even a modest amount of money can make. The money is distributed to individuals through the fund’s eight participating organizations, often in small amounts targeted to specific needs.